^ a b c "John Chapman". Swedenborg.org. Archived from the original on May 17, 2015. Retrieved 2015-06-06. ^ "Johnny Appleseed Education Center & Museum". Urbana.edu. Retrieved 2015-06-06. ^ "Scout.com: Fort Wayne no longer the Wizards". www.scout.com. Retrieved 2017-06-07. ^ "Johnny Appleseed: A Pioneer Hero,". Harper's New Monthly Magazine. No. XLIII. 1871. pp. 830–831. Retrieved 2018-10-08. . Full text of "Johnny Appleseed: a pioneer hero" at the Internet Archive. ^ Braun, Eric (28 August 2014). Johnny Appleseed Planted Trees Across the Land. Dustin Burkes-Larranaga (Illustrator). Capstone Press. ISBN 9781479554454. ^ "Man and Myth" (PDF). Archived from the original (PDF) on 5 September 2006. Retrieved 2006-08-18. ^ "The Straight Dope: What's the story with Johnny Appleseed?". Straightdope.com. Retrieved 2015-06-06. 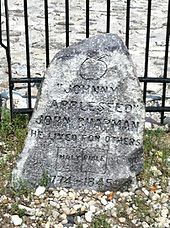 ^ "The John Chapman, Johnny Appleseed, memorial was erected in his memory and is in Swinney Park". Contentdm.acpl.lib.in.us. Retrieved 2015-06-06. ^ "Johnny Appleseed Festival". Johnnyappleseedfest.com. Retrieved 2015-06-06. ^ "My Name Is Johnny Appleseed". Americantowns.com. Retrieved 2015-06-06. ^ "Kootenai National Forest - Home" (PDF). Fs.fed.us. Retrieved 2015-06-06. ^ "Virginia Apple Growers Association". Virginiaapples.org. Retrieved 2015-06-06. ^ Eric Tingstad & Nancy Rumbel (25 October 1990). Legends (Audio CD). Narada. ASIN B000005OXY. ^ "Exactly what it says on the Text Edit icon." Macformat.co.uk. October 30, 2007. Archived from the original on 2007-11-09. Retrieved December 10, 2007. Wikimedia Commons has media related to Johnny Appleseed. This page was last edited on 11 April 2019, at 05:03 (UTC).